Hi, my name is Susie Birney. I’m 41 years old living in Dublin City. After working unhappily as an accounts clerk I made a drastic change to being a taxi driver in Dublin for 10 years. Unfortunately, lifting heavy cases I developed a hernia and was unable to continue the job I loved. I love everything to do with swimming. Regardless of my weight I kept swimming regularly. I’m a qualified swimming teacher and have taught children swimming part-time for 26 years now. I’m hoping to return to open water sea races soon. I recently did a skydive to raise money for charity and I never experienced anything so exhilarating before. I went back and did it twice more before the season ended..it not only felt powerful to be fit enough to jump from a plane at 10,000 feet, but I felt like I woke up and saw new opportunities around me..life had been passing me by while I was so unhappy living with obesity. My weight didn’t start to increase until I was in my late teenage years when my level of activity and participation in sports decreased. My bad eating habits I’ve had since infancy. I have a condition called Selective Eating Disorder. I’ve struggled to expand the small list of “safe” foods that I eat. I reject foods based on either the smell, the look, the texture, or the taste. For the most part I won’t even try new foods but for the rare times I do, I am likely to instantly vomit. I’ve never eaten vegetables, salads, most meat, the list is long. I quite often would just eat sandwiches for every meal, for days in a row. While I was active this didn’t make any difference to my weight but as life became busier and I started driving, it quickly increased. As my weight increased so did my depression. I then began to comfort eat as well as struggle to expand my poor diet. I tried neuro-linguistic therapy, cognative behavioural therapy and weight watchers many times, all with no success. I became a patient of the weight management clinic in 2009. At this point diabetes was my biggest concern but I foolishly believed while on my medication I was fine. I developed diabetic retinopathy in 2015. At this point I argued, and wrote letters to my health insurer, who soon understood it would cost them more to pay the care costs for my health issues if they didn’t support paying for my bariatric surgery. So they did, and everything has taken a dramatic U-turn since my bypass surgery in July 2015. My diabetes has fully reversed, including the retinopathy. My depression is close to gone. 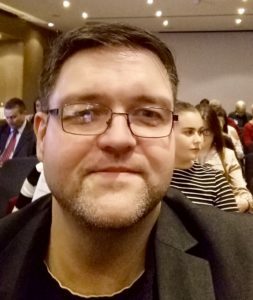 I have lost 13 stone (85kgs) and I have energy! The theme for the next European Obesity Day on May 20th is very appropriate for me personally. My weight loss efforts were always on my own. Family and friends cared but always had suggestions that started with “if you just..” They couldn’t understand. I became involved in a private online support group for the weight management clinic. I found that as soon as I surrounded myself with people who understood what it is like to struggle with obesity, the battle wasn’t quite so difficult. As an administrator for the group now, my primary objective is to try to help fellow patients understand that it’s when they are struggling that they should stay involved and chatting with others, rather than retreating within themselves as they say they feel shame at losing the battle to stop gaining weight. By not personally keeping my feelings and negative thoughts to myself, I feel I am more accepting that obesity is something I am going to fight all my life. I am only new to the Patient Council and have a lot to understand and learn, but I am impressed at the huge work that is being done to increase the awareness of the battle against obesity. I’d like to do my part in “Tackling Obesity Together”. Bias against people with obesity is well documented and has a major impact on health care delivery. People-first language can help tackle this challenge. It is widely accepted for most chronic diseases and disabilities. EASO and our partner organisations urge everyone to use people first language to tackle discrimination in obesity. Hi, my name is Sven Schubert. I am a 37 year old German software engineer and I have lived with obesity all of my life. I moved to Ireland from Germany in my early 20s, and have been living in and around Dublin ever since. A big computer nerd, I love science fiction and history. I speak German, English, some French, Czech, tiny bits of Dutch, Norwegian, Polish and Russian and am currently trying to learn Irish and Mandarin. I thoroughly enjoy a good book at home as much as an adventurous road trip. Did I mention that I love and ride motorcycles? I have been morbidly obese from age 2 on-wards and with brief excursions into the “just overweight” designation during my growth-spurt years, and a self-imposed 40% weight-loss in 1 year as I stepped over the threshold to my 20s. My weight yo-yo-ed and I reached a BMI of 85 in 2011, when I was admitted to hospital, put on a milk diet and in 2012 underwent gastric bypass surgery. I’ve lost 40% of my body weight since then, have hovered around a steady weight for 2-3 years and am currently battling complications from plastic surgery /skin reduction surgery earlier this year, which ironically sees my weight picking up again. What are your hopes for the EASO Patient Council at the 2017 European Obesity Summit? The challenges we’re faced with are for the most part not unique to a particular country or region. I hope we will find a common voice in communicating with the medical profession and can communicate effectively with relevant industry, including food and fitness, in furthering our endeavors. We want to create a respectful and well-informed environment in which patients can thrive and remain healthy or regain their health. How do you currently advocate for patients and how do you intend to advocate for patients in the future? Even before my surgery, I assisted at the local clinic, which is part of a university hospital, in educating their new medical students. I’ve told my story, shared my body and my soul, and would like to think I have made an impact, no pun intended. In my early post-op days, I was also involved with patient self-help groups, albeit more as a user than a provider of assistance. I took part in an Irish TV documentary aptly named “The obesity clinic – last chance for weightloss” which aired in 2012 and has been rebroadcast a couple of times since. In future I would like to raise my activities to a wider audience and on a more organised level, which is why I joined ASOI and the EASO Patient Council. I will continue to develop and improve my amateur level knowledge of nutrition, physiology and psychology and hope to pursue advocacy and related human sciences academically. Childhood and youth experiences of not fitting means fighting childhood obesity is a huge issue close to my heart. Having “lived” in a 200-300kg body for nearly a decade, and having experienced tremendous life changes following my weight loss surgery, I am convinced I can relate to some, if not most of the issues people with obesity have to overcome in everyday life. Reading up on the science of obesity in recent years has further shown me, that personal choice plays only a minor role in this complex minefield of genetic predisposition, environmental factors, food marketing and social pressure. I want to help improve patients’ lives and contribute to a better understanding of the disease that is obesity. I have been privileged to have attended four European Obesity Congresses. Over the years I have observed and have been part of the development and expansion of patient involvement in the Congress experience. The first year of my involvement, I was invited to speak at the 2013 ECO in Liverpool, which is my home city. I was invited to speak about my experiences as a patient as part of the DORIAN project seminar. The feedback I received following the event was really positive and I made some great personal connections. I was also fortunate to have been able to attend the pre-Congress bariatric surgery session. The speakers’ dinner that year was held at the Liverpool Football Club, which had a strong global reputation among attendees. 2014’s Congress was held in Sofia, Bulgaria. I was delighted to see many more members of patient communities attending. Friendships were made and bonds were forged. We held an organizing meeting where we participated along with several key European health professionals. The conference centre that year was a daunting Soviet era building. We spent time together and discussed developing a formal organisation. The seeds of a European patient community were sown there in Sofia. 2015 saw us travelling to Prague for the Congress. Prague is a beautiful and historic city. We were hosted by Patient Council member, Alexandra Fraisova. We held our first formal Patients Council meeting. As I looked through the photographs I took at the event – it brings back happy memories. 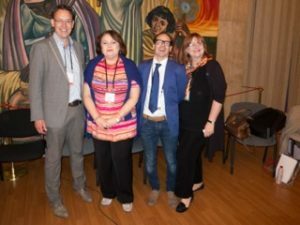 In 2016, the European Obesity Summit was held in Gothenburg, Sweden, where we were hosted by Patient Council Steering Committee member Christina Fleetwood and Swedish Patient Council member Orley Andreasson and his national association HOBBS. This most recent meeting saw the Patient Council reach a new level of engagement. Members took part in the opening plenary session, the media master classes and several formal sessions. We had a Patient Council lounge where we could spend time together and network between sessions and meetings, and we were delighted to welcome new members to our community. I spoke with many professional attendees and exhibitors at the conference, and the Patient Council is now truly a central part of the European Obesity Congress process. Although it is only August, plans are already being made for our attendance at ECO 2017 in beautiful Porto, Portugal. I would like to extend thanks to Sheree Bryant, Euan Woodward and Tommy Visscher for their professional and personal support. We also like to thank the Executive of EASO for their belief and investment in the Patients Council. My story is a story like that of many, a story intertwined with love and conflict with my mother. My mother was a cold woman, emotionally disconnected; now that I’m an adult I know she loved me as much as she was capable of loving, but this erases only part of my childhood pain. The memories I have of her are only of attempts to please her, and personality upheavals and emotions so that my mother would see me, because my mother couldn’t love me. And it eventually became alarmingly clear that the only way to get her to notice me was by gaining weight. I had no consciousness then. A young child deprived of a mother’s affection cannot understand the perversity of gaining attention finally by being supported by a dietician, identified by her mother, who put the child on a diet, and took an interest in her that to all the world might look like an unhealthy form of love. The first dietician my mom brought me to asks: “Why bring her here, ma’am?” I was 17 years old and only a few pounds overweight. 3 pounds. 3 pounds that separated me from the love I craved. But losing the weight, I find that she still does not love me. Control over my weight was manageable up to the time I was 25 years old. After 25, however, I could no longer manage the dieting yo-yo, the extra pounds become too much. Along with the weight grew my contempt for my mother. I began eating secretly, continuously, at every opportunity. With my increasing weight my self hatred grew. I endeavoured to hide and become invisible; I dressed only in black or dark blue so the world could not see me. Lies on lies: lies at home, lying to friends, lying to “experts;” I swallowed silent and desperate cries for help. The years pass by and the anger and pain do not move from my heart; all the while my fat layer increases. I was happy and smiling on the outside and dead inside, with the classic, nervous and irritating “settlement”, giving in to a thousand compromises with yourself for any sign of love, so not to feel alone. The lack of mother love sparked a frenzied emotional search for acknowledgement: “Look at me, I exist !!!”. Always, I tried to be “as you want me”, a Marina that does not correspond to that buried in fat. Because Marina has lots to say NO, but she can never say NO to anyone, for fear that speaking out might deprive me of affection. And then there were a series of family deaths, serious ones, the kind that’ll break your life into a thousand fragments, and you wonder if you shall ever manage to overcome them. My father died, as did my sister. My mother becomes sick, her illness imprisons her forever in a glass cage: Alzheimers disease. The mother with whom I would argue, the mother who I was never able to really confront, was suddenly gone. She became a pile of bones, a hand that seeks yours, and trapped words. This opens up a world, and a new thought began to buzz in my head: I’m not bad or unloveable. I’m not just a compulsive eater, I am compulsive in every area of my life. I am sick of compulsion 360 °. I decide to have bariatric surgery, specifically gastric banding, without delay. It was 2004. I’m free, Mom cannot tell me what is right or wrong for me. I had reached a weight of nearly 136 kg. I’m always just looking for the magic wand. In light of what we now know about managing obesity I sadly came to realise that I was just repeating behaviour I have experienced a thousand times in the past. I lost some weight, then a deadlock emerged. Not one gram of weight disappeared from my body. And I started looking for any way around it. But why? Why not try to change some of the attitudes that led me to obesity? I like to think of these most recent years of my life as a coming to consciousness, such a fantastic time that Marina is allowed, for the first time in her life, permission to be herself. So out with the black and blue dresses! Amici Obesi is an immense help to me, and provides a place where I can meet a lot of people and test myself to see whether the Marina who is emerging makes sense, if the Marina who writes and interact on the forum is authentic. And I am…protected by the digital world, protected by anonymity, I can really let let my story emerge. Food still has enormous power over me, but I see it subside a bit more every day; it is no longer in charge. Every day that passes, I become a bit stronger and it is a bit weaker. 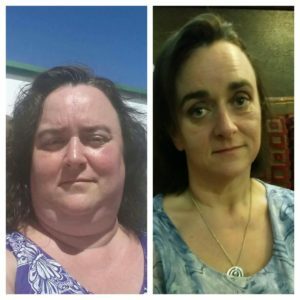 My new beginning led me to a gastric bypass surgery and the removal of the gastric band. With the second operation I lost 55 kilos, and I see myself without guilt, because I still feel like a fighter; I have to save myself. I know I can get better and, above all, I know, now, that my fat layer has lost its initial “utility.” I’m ready to live without this protection, I do not need more. I do not deny and reject it, as you deny past love: Obesity gave me a lot, and allowed me to be the person I am today and allows me to be able to say to that mother who is no longer alive: “I loved you so much, more than I ever thought I could”. Because only a great love could survive so much pain. I live in Italy, in a small town, Vercelli, beautiful countryside with rice fields. My primary interest and my passion is information and treatment for obesity. I also love playing with my cats and dogs, I like listening to liri music, reading good books and writing. 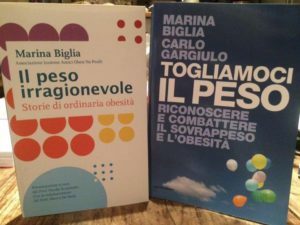 Togliamoci il peso (in English “Let’s get weight: recognize and combat overweight and obesity”). I’m not only a patient, I believe that simple and truly, I represent the disease. I am not only an economic cost, I am the daughter of our European failure in prevention; all of society has helped create obesity and we people with obesity have the right to treatment. Because it is only when I talk about obesity am I certain you know what I mean, I feel authorised to do so, especially for people with obesity, because I am like them. I weighed 136 kg. I know is what obesity is for those affected, what it means, not only physically, but emotionally and in terms of pain, shame and guilt. And you can not be guilty of an illness. For our societies, across European nations, the very first step will be to accept obesity as a disease. Years of obesity have taught me one thing, essentially: that no can understand obesity like another person with obesity. We have to convince others like us to break the silence surrounding our disease, and the one and only way to do that is through association and discussion. In practice we have to fight for a right to treatment. We need the medical profession to recognise our illness. In addition, I think it is necessary to bring attention to the fact that obesity is a multifactorial disease. There is no magic bullet. We need to treat each patient full circle: from psychotherapy to nutrition, and if necessary medication and surgery. And then it is also essential, in my view, for human support from other patients, both real and virtual. Nothing gives you more strength and courage on the road to a new life than sharing and support from those who have been on the same journey. That’s why Amici Obesi Onlus exists in Italy. I hope to bring my knowledge and my experience to help other people who suffer from obesity. I’m sure that together, we can make a real contribution! On the 12th of May I was delighted to be invited to speak at the North West UK meeting of the Association for the Study of Obesity, Obesity Management: A selection of stakeholder viewpoints was an interesting meeting with an enthusiastic audience and a variety of speakers who provided a balanced view. Dr Ruth Carson,Consultant Lead Psychotherapist, Head of Eating Disorders Service, Mersey Care NHS Trust, kicked off the event with a great talk – “How might a psychological perspective enhance the work of weight management and bariatric services?”. Fiona Chan, weight management dietician, Salford Royal Foundation NHS Trust, gave a stimulating talk entitled “Dietary guidance for medical and surgical weight management”. 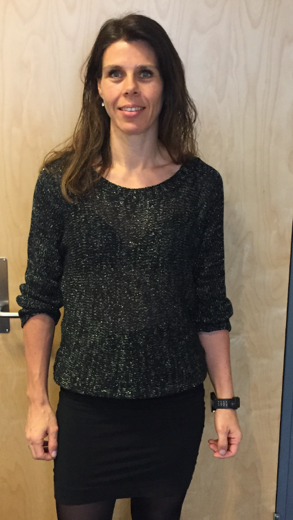 The session ended with Dr Juliet McGrattan, who is the Public Health England Clinical Champion for Physical Activity in the North West and resident GP for Women’s Running UK magazine, gave an energising talk: “Physical activity in weight loss”. Audience feedback was excellent and all agreed it was a fantastic event. Obesity management: A selection of stakeholder viewpoints’. ASO North West Regional Group, Liverpool, 12th May 2016. We are delighted to welcome a new member to the EASO Patient Council. My name is Marieke Aarts. 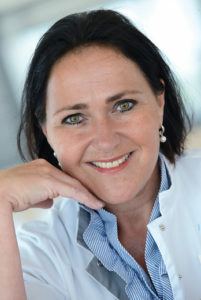 I am a 48 year old woman from Holland, and I work as a Bariatric nurse. All of my life I have been overweight. Six years ago, I had a gastric bypass operation and lost 60 kgs. This changed my life completely. I am the mother of two beautiful and talented children, Sophie (13) and Pieter (11). Last year my husband and I divorced. For 28 years I have worked in the same hospital, and for the past 8 years I have worked as a bariatric nurse. I particularly find my work as a Bariatric Nurse here in the Catharina Hospital in Eindhoven, which is an excellent bariatric centre in the south of the Netherlands, very rewarding. As I think you are aware, the Netherlands is a small country near Germany. There are many people with severe, morbid obesity people living in the Netherlands. We believe 360.000 among a population of 17 million people are obese. In addition, fully 48 % of the adult population has overweight. So, we have much to do and very many people to reach! Of course my very favourite thing is my two children and my family. I will also mention my new relationship! A great interest end hobby of mine remains is my work and my enduring passion as bariatric nurse. I love to run, and participate in half marathons; I also like to go to football games. A quite activity I enjoy is reading a good book. All of my life I have been overweight. By the time I was eleven years old my weight was already 80 kg. By the time I went to study as an adolescent, I started to drink beer, as many teens do, and my weight went up. Following the birth of my children my weight reached a peak of 130 kg. it was then that I decided I was not setting a good example as a mother and being the rudder for their ship as I wanted to be. It was at that time the idea was born for bariatric surgery. What are your hopes for the EASO Patient Council at the 2016 European Obesity Summit? When I reach out and connect with one person by telling my story, it sometimes has the impact of changing his life, and inspiring him or her to choose quality of life. I am a person who tends to ‘go for it’ and I share my entire story with all my attendant insecurities and secrets! Using evidence – based practice and research to inform my choices! These are some of the reasons I find this organization (EASO) so important! I am really glad and thankful to be a new member of the EASO Patient Council. Joyce, what has your experience of obesity been? My experience with obesity… I used to be obese and I still have to struggle with this every day. I was always the biggest girl in my classroom, maybe there was another girl bigger than me in another class, but I had a label: I was a big girl. Although I was practically never bullied directly about my weight (except once or twice), I felt ugly and I felt labelled. But I was/am more than a big girl. I’m Joyce, I’m passionate, stubborn, dedicated, lovable, unselfish etc. Later on I received job rejections (3 times) because I was overweight. At the first job I was asked how I can have any discipline for hard work if I can’t have discipline around what I put in my mouth. The other two just said I wasn’t “presentable” enough for their companies. After I found a good job and performed very well… I was called for an evaluation on the other side of the country. “You are very good” they said, “you are an example for other consultants. However… if you want to grow… you should lose weight”. Turned out I really had to, because I wouldn’t fit into the car I would get (Mini). ☺ In addition to all of this, I couldn’t ski anymore because It hurt too much, my knees hurt and my back hurt. I couldn’t do a lot of things and struggled with many activities. “I hope at least one patient will realize they are not alone and know that there are people in various organizations who can help. I was also shocked to learn that obesity wasn’t recognized in Europe as a disease, apart from Portugal! I hope politicians from around Europe realize this is a disease and a very serious one. When you are addicted to smoking, there are pills, patches etc. Similarly there are other strategies for addictions like alcoholism. Or let’s mention anorexia… when people are addicted to eating (and their metabolism isn’t very good…) they can’t just remove themselves from the seductive situation. They have to make a right decision 3 or 5 times a day, every day, every time. Obesity is a modern disease and causes a lot of health problems overall. I really hope politicians and European countries can finally see this. April has been a busy month for the EASO Patient Council. Our colleague Sólveig Sigurðardóttir has been awarded a significant community prize by Fréttabladid, the largest Icelandic newspaper, for her work campaigning against ‘fat shaming’. She is photographed here with the President of Iceland Mr. Ólafur Ragnar Grímsson, who presented the award. Sólveig has been campaigning in Iceland for years on this issue and EASO congratulates her on this impressive national recognition.